» The Matter with "All Lives Matter"
» Is Luck a Skill? » "It Shouldn't Have to Work That Way"
In recent posts I've looked at the use of the word "day" in the Genesis 1 creation story, and at how that story should be understood within the larger context of Genesis. This context is important if we are to dig below the surface and find the deeper meaning of the Bible's first creation story. But before we dig deeper, let's take a little time to explore the surface. Young-earth creationists are quick to stress the importance of believing in a six-day creation. They make claims like, "If Genesis is not true, then the whole Bible is suspect." But do they really believe that? If we were to genuinely read Genesis 1 as history, we would have to adopt a vastly different model of the universe. Traditional Jewish and Christian teaching tells us that God created the universe and everything in it from nothing. There were no preexistent raw materials; God created simply by divine fiat. He said the word, and it was. You can see this idea in Psalm 33:6-9 and Jeremiah 10:12-13. It's referenced in Isaiah 45:7-9 and elsewhere. The notion that God can create something just speaking it pervades both Jewish and Christian scripture, even the bulk Genesis 1. But Genesis 1:2 contains a different idea. The "formless void" and the "face of the waters" would be more at home in Babylonian mythology, where creation begins after the supreme god Marduk defeats Tiamat, goddess of ocean and chaos. The Babylonian creation epic Enuma Elish tells how Marduk, following his victory, sliced up Tiamat's corpse to make the earth and the sky. Genesis adopts this imagery, minus the cosmic battle, as a starting point for its own creation story. This dome, known in some translations as the "firmament", separates the waters below—the primordial chaos—from the "waters above", which would be unleashed later in the Noah story. 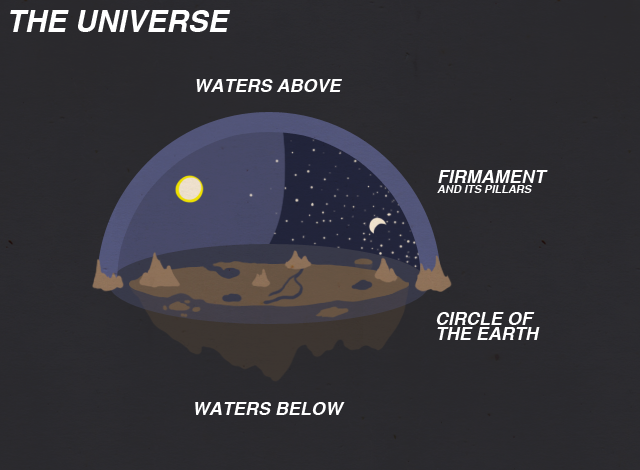 The nature of the firmament is described elsewhere in the Bible. Though it is stretched out like a curtain or tent, it is firm and hard as a molten mirror. It is solid enough that God can walk on it and and build chambers up there. It is not simply a euphemism for the atmosphere or sky. Genesis doesn't describe how God accomplished this task, but Proverbs informs us he "drew a circle on the face of the deep". This disc-shaped land floats on the waters, held up by pillars to stabilize it—although when God is angry, he can shake even the pillars. The notion of earth as a ball in orbit is nowhere to be found. Notice that the sun and moon are both described as lights, and they have been placed in the dome. In the cosmology of Genesis, the moon is just a dimmer version of the sun. The earth is the center about which the lights of the dome rotate. Though God can hold the sun in place if he wants to, it is the earth that God put firmly in place from the beginning. If we are to read Genesis as history, this is the picture of the universe it describes. If creationists want the six days taught in science class, they ought to advocate the firmament, the pillars, and the flat earth as well. They don't go that far, of course. In fact, they go to great lengths to deny the Bible says such things. The same people who insist we treat the phrase "six days" as definitive, are fine with applying ambiguity to nearly every other term found in the first half of Genesis 1. It's no mystery why: Taken as a whole, the cosmology of the Bible is not a viable worldview today. We can't take the Bible's first creation story as a historical account. But if we can get past the surface of the text, there is plenty of meaning to find in this story.